So often, so so often, I am asked what I do for work by socialites and strangers who I've just met, and when I tell them I blog as a living, I often can be found staring back at confused faces, or answering confused person's questions! 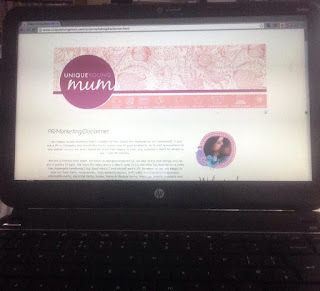 This little piece of the internet - Unique Young Mum, is not only a blog, it's my blog, and also my job - my career. It's not an easy career though, not as easy as so many people including my friends and family seem to think. The thing is, is if I don't get paid work, then I don't get paid, which means the bills don't get paid and shopping can't be done, meaning no food in the house - not that it ever does happen, but I've been close enough! The blogging world isn't as easy as 123, you can't successfully start a blog and expect it to take off in one day, one week or even one month. I admit, I was lucky in the sense that I got to work with companies and brands very early on in my blogging days, I owe a big shoutout to Popagami for my initial first shot on the scene, but that didn't come easy! Its all the hours of admin that no one witnesses, its the hours replying to emails, the hours sorting out and deleting junk emails, the list never ends! Working from home is a bonus, it means I can guest post whilst wearing my pjs on a lazy day! It's getting your blog linked around the internet, without spamming your link, and effectively giving your blog a bad name, which is where guest blogging comes in super handy. Basically, to get paid to 'blog' or rather write which is the term I prefer, you need a few decent statistics behind you, Domain Authority, Page Authority, occasionally Pagerank and similar metrics all count towards your internet score, a score you want to be higher rather than lower! The lower the score means no work, or very very low paid work and so back links are an effective way to raise your scores, meaning better paid opportunities, and more likely more work! For so long, I put off hosting guest post and also writing guest post for other blogs and sites, but I must admit I am seeing small but handy changes! David is just one of the few people who has got in touch with me in regards to guest posting! 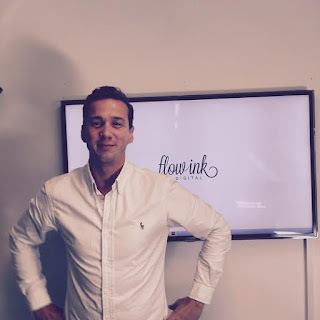 Digital Marketing Agency Hertfordshire Flow Ink uses the guest post process to drive traffic to their clients websites, with guest post being one of the most inexpensive ways to gain backlinks, its clear to see why they're such a good idea. Using high quality sites may mean a juicy little backlink, but please do make sure the site is relevant to your readers, especially if you're a blogger because there's nothing more cringe than seeing a food post on a technology blog, if it's not bread and butter, don't try and make it work, it won't and can't! Finally, finishing off the subject, I'm interested in hearing your views on guest post! Do you love them? Hate them? Please do drop me a comment below!